“A cup of coffee is remembered for 40 years” proverb is a saying that has been told since 16th century when the coffee was started to be used by the Turks. We know that coffee was expanded in Arabic Peninsula, Egypt and India before Turkey. As a matter of fact coffee comes from the Arabic word “kahwa”. It is expected that this word was taken from the Kaffa region in Ethiopia where coffee has been produced. The first place that coffee was produced is Arabia. Coffee drinking habit which started at the south parts of Arabia and Yemen together with the coffee agriculture reached to Turkey in the 16th century by rapidly expanding towards west. There is some information that the coffee was first brought to Ottoman Empire by two Syrians who were named as Hükm and Şems. In other sources it was noted that coffee was brought to the Ottoman Empire in the period of Süleyman the Magnificent (1520-1566) (Kanuni Sultan Süleyman) by the Ethiopian Governor Özdemir Pasha. The first coffee house which was opened in Tahtakale drew attention not only the common people but also the literate segment at the university professors of Ottoman Empire at that period and Cadis (judges of Islamic canon law) level. The number of the coffee houses in Istanbul exceeded 600 during the Sultan Murat the Third. Coffee houses were generally built in nice places with good views as mansions and often had verandas. In these mansions it was seated all around and it was also served hubble bubble and pipe stem beside coffee. The old coffee houses turned to be centers where the man of letters and musicians come together in a short span of time. These coffee houses had been indispensable parts of social life in the Ottoman Empire. However the place of the coffee in the palace was quite different needless to say. 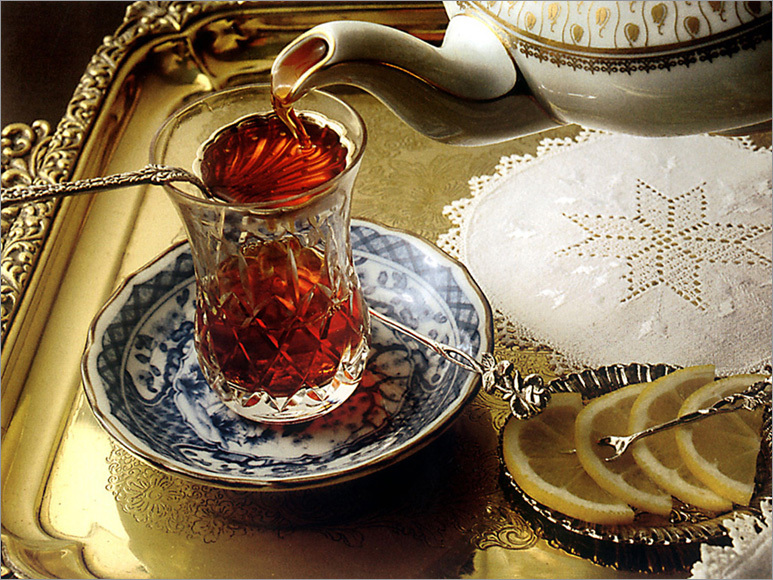 The job of preparing the Sultan’s coffee had been a very important task. The person who prepared the Sultan’s coffee was among the persons who were close to the Sultan and this job was accepted as a respectful job. Small stoves where coffee was made were placed as different locations in palaces, mansions and dervish lodges and the male servants were quested in these locations. In the magnificent halls of the palace coffee was served to the Sultan and quests by the coffee experts who were accompanied with 40 personnel and the concubines were trained for making proper coffee in the harem.In 1615 the Venetian merchants and in 1650 the Marseille merchants encountered with Turkish Coffee in the Ottoman Empire and caused Turkish Coffee to overspread worldwide. French novelist Pierre Loti had continuously visited coffee houses in consequence of his affection to coffee and Istanbul and today a coffee house in Eyüp which is the district that he loved most is called by his name. Pierre Loti Coffee established central role of the “Turkish style” cultural elements such as Turkish coffee, hospitality and to go to ask a girl’s wish in marriage. The reason for calling such coffee as Turkish coffee is because of its cooking method. It became famous with Turkish coffee name since its coffee beans which are thinned by pulverizing or grinding is cooked in Turkish style. 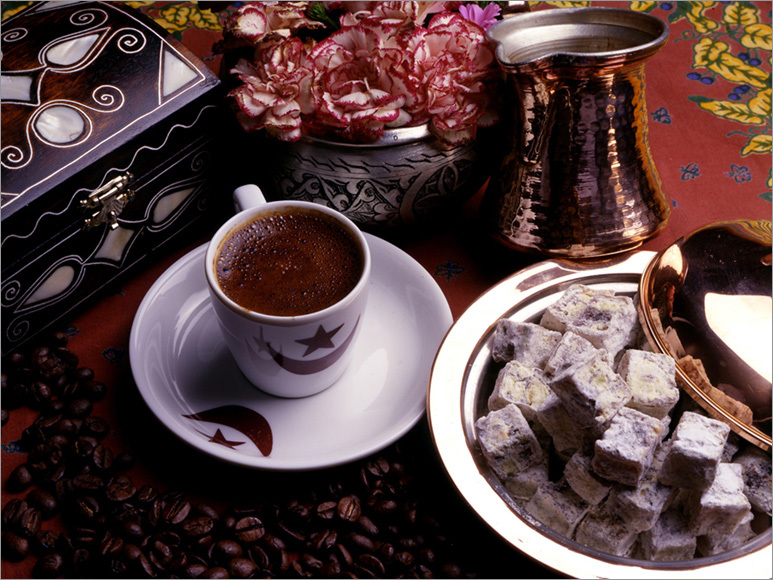 Turkish coffee is the coffee of which its taste remains in the mouth for the longest time. 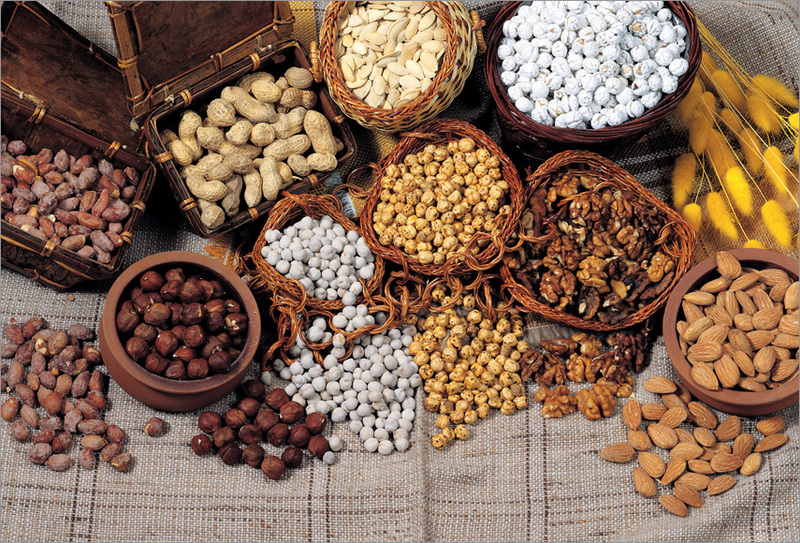 It is produced from high quality beans of “Arabica” type which is not grown in Turkey. It should be consumed immediately afterwards or packaged to preserve its aroma in order to save its excellent taste. The residues of Turkish coffee grounds remain at the bottom of the coffee cup and this residue as coffee grounds. The tradition of reading from coffee cup arises from such coffee grounds. The researches put forward that to tell fortune from reading from the coffee cup’s grounds is seen only in Turkish-Ottoman world. In the old times, the coffee was not sold as ready to drink as today, it was roasted in coffee pans when it was needed by being bought in green beans and was cooked quite freshly by being grinded in hand operated coffee mills. However, in some regions the coffee bean was pulverized in pounding mortars which were placed in the garden outside the kitchen and which were named as stone mortars in lieu of coffee mill. Kurukahveci (Dry Coffee Maker) Mehmet Efendi was the first man who presented to the market in packaged forms by roasting and grinding it and has been the brand mark of Turkish coffee. In the old times the coffee was boiled in water ewers with handles and long spouts and was presented in big coffee cups without handle. The coffee cups were called as large coffee cup and the most delicious coffee was the slowly cooked one in the glowing coal of the brazier. Drinking Turkish Coffee is a tradition on its own from the choice of coffee pots to its preparation at low heat, from pouring little by little to coffee pots to supping bit by bit with a ceremonial attention. The appliances and kitchen materials which are used in the stages of the Turkish coffee are in the richness that can form a museum. All of the long spouted water pitchers which are made from copper and brass, coffee pots, coffee cup covers and coffee hangers which are used to carry the cooked coffee have characteristic properties. In the old times the coffee cups were manufactured both in the workshops in İznik and Kütahya in the country and in the famous porcelain centers of Europe entirely in accordance with Turkish style and motifs. Some appliances and cooking materials such as cooling case, preservation box were made of wood and were decorated by carved designs. The embroidered, written coffee mills which are manufactured in Bursa and Istanbul are also famous. A coffee which is good enough for a fiend should be cooked for 15-20 minutes over low flame and the coffee pot should be put at fire time and time again. A Turkish coffee without foam can not be thought howsoever it is cooked. In the old times Turkish coffee was generally cooked without adding sugar and before or after a sweet thing was eaten or drunken. Turkish delight was heading the list. Turkish coffee was generally prepared with sugar between women. There are over forty coffee cooking styles with the names such as without sugar, served with sugar brought in the saucer. Fragrant materials such as jasmine, ambergris, clove and cardamom were placed at the bottom of the coffee cups if the coffee was wished to carry a different and beautiful scent. Please, start the process by putting the drinking water which is measured by coffee cup into the coffee pot, it would be ideal for making coffee for a person at each time; this is easier as it eliminates the apportioning of the coffee foam. You should add two teaspoons coffee for each cup, and also two teaspoons of sugar if you wish medium sugar coffee. You should stir the coffee and the sugar at low heat carefully and thoroughly. After a little while apportion the swelling fame into coffee cups. Bring the remaining coffee to the one more boil and then pour into the coffee cups little by little. It is a tradition to give a glass of water at the side of coffee service. The water which is drunk prepares the mouth to the flavor of coffee. Liquor may also be served together with the coffee. Turkish coffee is the coffee which is most favorable to health conditions from all aspects. There is not any adverse effect on health when it is drunk in dosage. 50 mg caffeine in one cup of coffee is discharged from body within a short time of period. It has a property which provides mental alertness and giving energy when it is drunk for more than one cup. It prevents gaining weight and heartburn/stomachburn by means of this property provided that not to be drunk with sugar. Tobacco has been used by various civilizations in different ways, from time to time it became a pipe, and sometimes a cigar or a cigarette, and some people chew the tobacco some bubbled noisily his/her Hubble bubble The name of the Hubble bubble which is an important constituent of the East Culture comes from a word “nargil” in Farsi which means coconut. The first samples of the Hubble bubble which is named as “cupping-glass” by the Arabs and “hookah” by the Persians appeared in India. Indian hemp was smoked by the first Hubble bubble which was made by a bamboo digging into the outer covering of a coconut after emptying its inside. The porcelain and bronze bodied came into existence as the Hubble bubble became widespread and the glaze tile, silver and glass bodied ones followed these Hubble bubbles. The Hubble bubble which became widespread first among Persians than the Arabs entered into the Ottoman Empire at the 16th century. 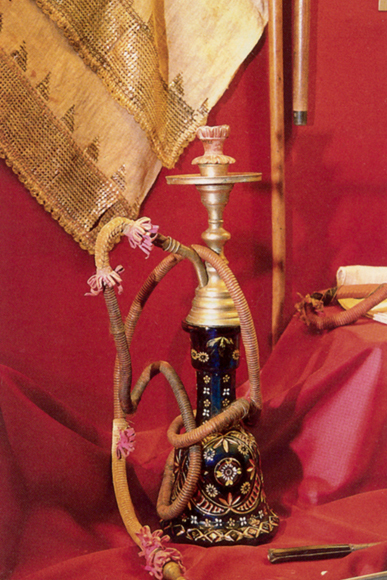 Ottomans added their own style to the hubble bubble and added on top of its head a holy ash tray from soil material which is used for putting tobacco in it and called it as bowl of a tobacco pipe. Making and selling bowl pipe had been a profession in time and even a bazaar in which the bowl pipe artisans worked was developed in Tophane. The mouthpiece which is generally of amber of a tobacco pipe which is placed at the part where the tube of a Hubble bubble touches the mouth is also an addition of the Ottomans. Hubble bubble consists of four parts: Mouthpiece, Bowl, Tube and the body which is full of water, by its other name the head. The mouthpiece which was made of amber that was believed in that does not catch infection in the old times is made of single use plastic for the time being. Tube of the Hubble bubble manufacturing also turned to become an art in the 19th century. The bazaar of the tube manufacturers is at the Mahmutpaşa entrance of the Egyptian Spice Bazaar. The experts who manufactured the body which is called as cupping-glass decorated the cupping-glass which is made of Beykoz glass with graceful ornaments. In the old times the bodies were made from silver or crystal. In Ottoman period in the hubble bubbles it was only used a tobacco which came from Iran. This tobacco which is named as Persian tobacco was treated from some processes and was washed several times in order to prepare it to be smoked. For the hubble bubble fire it was only used coal fire of oak and it was thought that the aroma of oak was also included in the flavor of the hubble bubble. In the old times it was obtained different flavors by also adding rose water and pomegranate water or fruits such as grape to the water of hubble bubble. Today, special aromatic tobaccos are available. You can choose Persian tobacco with one of strawberry, melon apple, cappuccino, coffee aromas according to your gusto. Hubble bubble is the crown of the deep conversations for today as it was in the old times. You can also get acquainted with this very special flavor if you wish. The favorite places in Istanbul where you can smoke hubble bubble are the hubble bubble coffees in the districts of Tophane, Kuledibi, Gedikpaşa, Kadıköy, Eminönü and Beyazıt. Most of these coffees are open till morning. You should breath in your hubble bubble as you are taking in breath first you attach your reed on the edge of the tube, it depends upon your choice to prefer one of the methods you can bubble the hookah whether from its body or breast. But the difficult one is to realize this process from the breast. You should not breathe in for a long time and with frequent intervals. You can put some cold water and some ice in the hubble bubble bottle. Average smoking period for your hubble bubble is about 1-1.5 hours. If you have a hubble bubble set we recommend you to maintain its tobacco in the plates in which the tobacco does not get dried. It may be useful to smoke hubble bubble in the airy places but you should definitely not smoke it in windy environments. It is recommended to smoke hubble bubble when you are full (satisfied with food). We recommend you to wash the bottle, body and the mouth piece after each smoke. 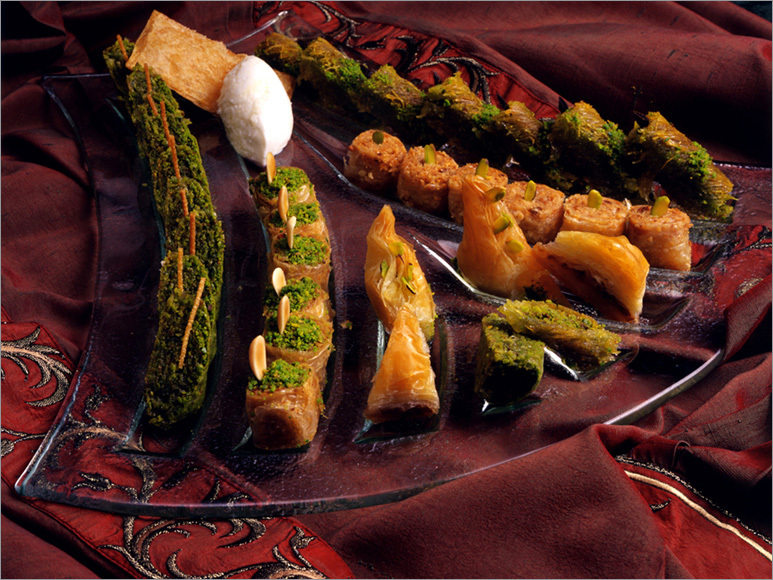 It is estimated that the Turkish delight also became widespread starting from the 17th century in the Ottoman. The outer surface of the Turkish delight is generally coated with caster sugar or coconut after adding supplementary materials such as hazelnut, pistachio nut, walnut, sesame, saffron and clotted cream in its interior part which is cooked with syrup and starch. In the old times when there was not any sugar honey and grape molasses were used in Turkish delight manufacturing and also flour in lieu of starch. It was started in Europe to be manufactured sugar from the sugar cane which was brought from the South America and real sugar was started to be used in candy sugar and Turkish delight manufacturing in Istanbul towards the late years of the 18th century. Starch was discovered in 1811 and it started to be used in confectioner manufacturing. Hadji Bekir the head of Confectioners in the Ottoman hailed from Kastamonu. 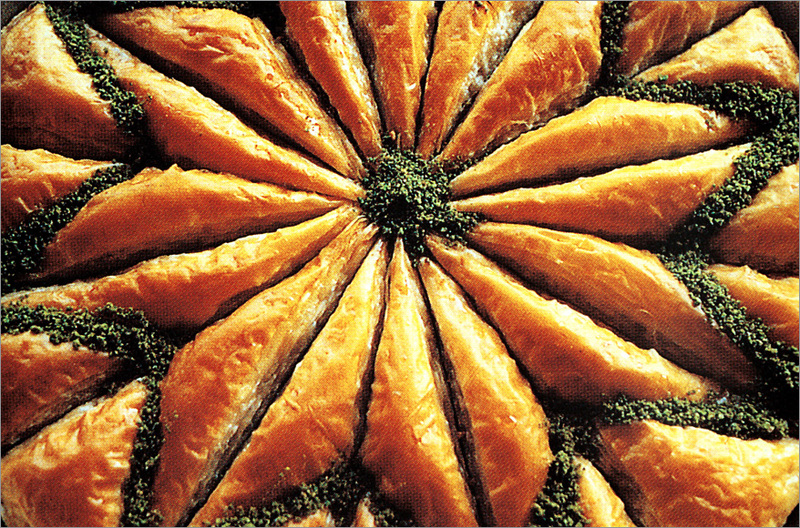 However, he started to confectionary manufacturing in Istanbul by apprenticeship and opened his own shop in 1977. At those days the most famous sweetmeat was Turkish delight and candy sugar. The best of Turkish delights which were sold in the shop at Bahçekapı was the one which was made by clotted cream layers or the ones which were made of pistachio and hazelnut. 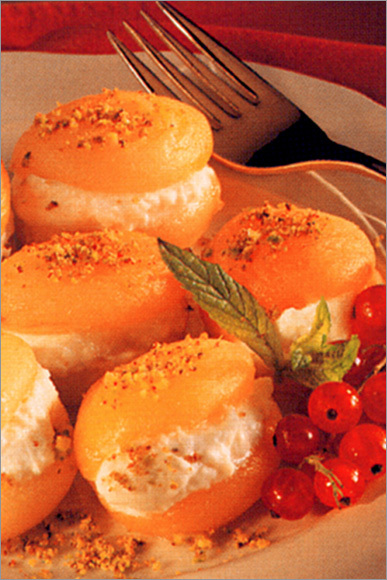 The creamy delight of Hadji Bekir had become a subject of common talk with appreciation. It was told that this creamy delight was such a delicious taste so that the sultan of that period always chose this one among endless number of candies which were manufactured especially for him. When a tourist who visited the shop of Hadji Bekir and liked the delights very much approximately 100 years ago brought a box of such delights to England, Turkish Delights have gained fame worldwide. Turkish delight is still a confectionary which is in request and favorite in Turkey and Europe also for today.